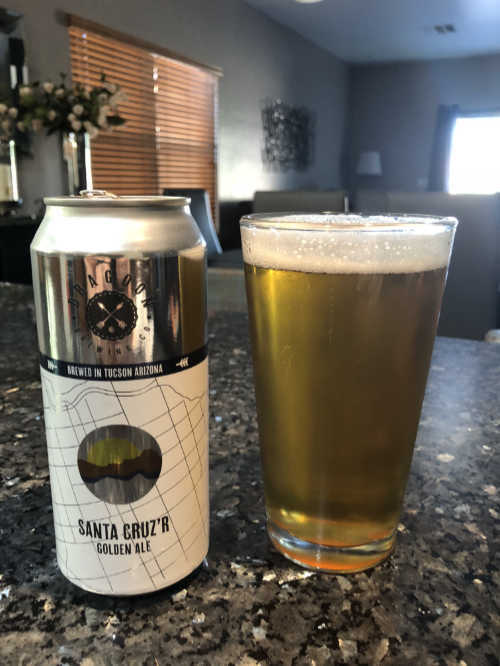 Dragoon Santa Cruzr is one of those beers that does not match the name to the style. There is probably some reasoning and I have just not got around to ask. This is a Golden Ale with a nice crisp pale ale that you could accidentally call a lager because of the hop profile. It has a minimal 15 IBU, but they bring a nice citrus taste. This ale is extremely clear. It is colored just like the name says. Golden in color but don’t think that it is a light beer in taste. There is 4.9% ABV in this one. They call it a session beer and I can agree with that term, but it is in no way a light weight when it comes to malt flavor. There is plenty of flavor in this one. Similar to a blonde, there is not a lot of fragrance in this brew. In the picture to the left you can see that the head, relatively small, dissipates quickly. Just so you know, I use Diversy’s Beer Clean products for cleaning my glassware. It does a damn good job so I know that quickly dissipating head has nothing to do with a dirty glass. This beer did not have any lacing, or I guess I should say that it was minimal lacing. It only lasted as long as the head did. I can also say that the hop aroma did last through this entire beer though. It was very nice and the mouthfeel was consistent as the beer was drank. I would give this beer a 4.2 for its unique lasting hops and the session quality taste, yet excellent flavor. 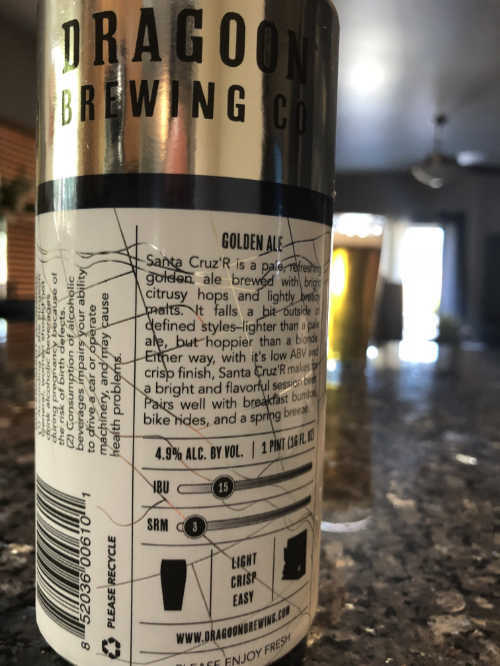 There are many breweries that try to make their cans unique. 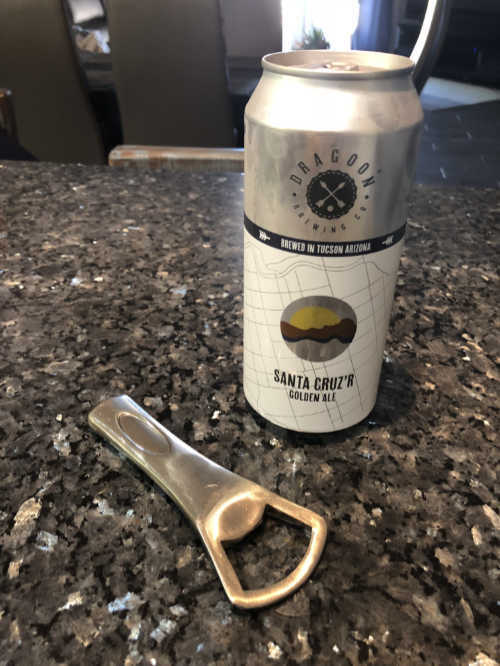 Dragoon is no different, but it looks like the can is very basic at first glance. You have to take a second look though. They keep the same look with the silver top with the brewery logo up there in black and a simple name, beer style and picture. Take a close look below. You will see in this image it almost looks like a map. Well, it is! They do something unique in all of the white areas in the background. You will also see a nice SRM and IBU scall and the type of glass that you should be using as well. Nice touches. 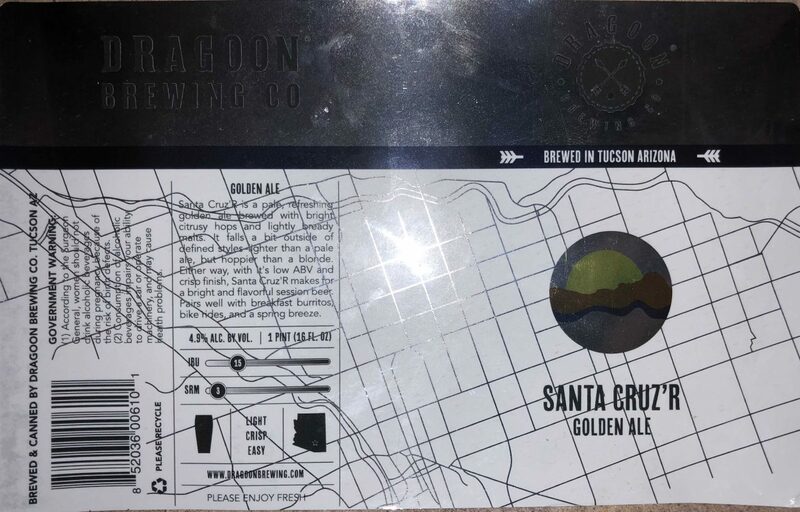 This entry was posted in Beer Reviews and tagged Ale, Dragoon, Local, Tucson.